(c) Select "DATA MONITOR". 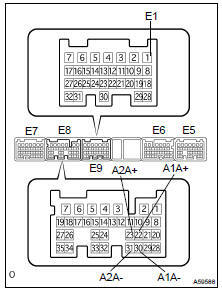 Then select "A/FS B1 S1", "A/FS B2 S1" and "O2S B1 S2" to display the monitors. (e) Keep the engine speed at 2,500 rpm and confirm that the displays of "A/FS B1 S1" and "A/FS B2 S1" are as shown in the illustration. If necessary, replace any damage parts. (b) Install a vacuum gauge (EVAP control system test equipment vacuum gauge) to the EVAP service port on the purge line. (c) Connect the hand-held tester to the DLC3. (e) Turn the hand-held tester main switch ON. (f) Use the ACTIVE TEST mode on the hand-held tester to operate the VSV for EVAP. (g) Check the vacuum while the engine is idling. (i) Disconnect the hand-held tester from the DLC3. (j) Disconnect the vacuum gauge from the EVAP service port on the purge line. (k) Connect a pressure gauge to the EVAP service port on the purge line. (l) Connect the hand-held tester to the DLC3. (m) Turn the ignition switch ON. (n) Turn the hand-held tester main switch ON. (o) Use the ACTIVE TEST mode on the hand-held tester to operate the VSV for CCV. NOTICE: In step (m), the ignition switch should be ON, but the engine should not be running. HINT: If the check is not completed within 10 minutes, the VSV for CCV will be reset and close automatically. Add 13.5 to 15.5 in.Aq of pressure from the EVAP service port. Check if the pressure decreases when the fuel tank cap is removed while adding pressure. (q) Turn the ignition switch OFF. (r) Disconnect the hand-held tester from the DLC3. 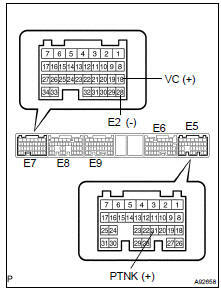 (c) Disconnect the VSV connector for EVAP. (d) Connect the battery's positive (+) and negative (-) leads to the VSV terminals for EVAP. (f) Check the vacuum while the engine is idling. (h) Disconnect the battery's positive (+) and negative (-) leads from the VSV terminals for EVAP. (i) Reconnect the VSV connector for EVAP. (l) Disconnect the VSV connector for CCV. (m) Connect the battery's positive (+) and negative (-) leads to the VSV terminals for CCV. (o) Disconnect the battery's positive (+) and negative (-) leads from the VSV terminals for CCV. (p) Reconnect the VSV connector for CCV. (q) Disconnect the pressure gauge from the EVAP service port on the purge line. 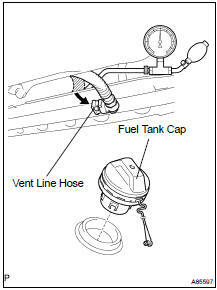 (a) Disconnect the vent line hose from the fuel tank (see page 12-28 ). (b) Connect the pressure gauge to the fuel tank. (c) Apply pressure to the fuel tank to create an internal pressure of 4 kPa (41 gf/cm2, 0.58 psi). (d) Check that the internal pressure of the fuel tank is maintained for 1 minute. v (e) Check the connected portions of each hose and pipe. (f) Check the installed parts on the fuel tank. (g) Reconnect the vent line hose to the fuel tank. (c) Fill the fuel tank with fuel. (e) Remove the fuel tank cap, and check that pressure drops.